This week on Replay we take a look at, arguably, the best Transformers video game. Our final Transformers profile, with concept art and info on this fan favorite Decepticon. 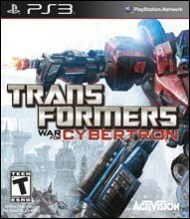 Your first look at Cybertron's various locale's in Activision's new Transformers game. Check out art and new info on the powerful Decepticon leader. We visit the developer behind Transformers: War For Cybertron and look at their history.